The Roosevelt Hotel is a historic Spanish-style hotel located at 7000 Hollywood Boulevard in Hollywood, Los Angeles, California. 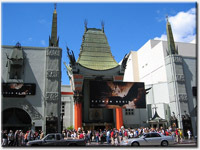 Named after Theodore Roosevelt and financed by a group including Douglas Fairbanks, Mary Pickford and Louis B. Mayer, it first opened its doors on May 15, 1927. It cost $2.5 million to complete this twelve-story building which holds 300 rooms and suites. It is now managed by Thompson Hotels.